The brave Iranians demonstrating against the ruling regime deserve our support. At least 13 have been killed already. The government has allowed the protests (so-called vigilantes attack protesters afterwards), but it continues to arrest prominent reformers and to attempt to stifle the flow of information by limiting Internet access and pressuring reporters to stay away. Yet hundreds of thousands—Tehran’s mayor says three million were in its streets Monday–continue to protest, risking bullets and long jail terms under harsh conditions. The regime’s repression of May Day demonstrators and jailing of trade unionists was a taste of what to expect during the current protests, which are the largest since the overthrow of the Shah’s dictatorship in 1979. Below is a call from labor organizations to make June 26 an international “Global Solidarity Action Day” in support of Iranian workers and a list of the demands made at the May 1 demonstrations. We should reject the view—shared by the U.S. bourgeois press and some of the U.S. Left–that the demonstrators are only against the stolen presidential election and for opposition candidate Mir Hussein Moussavi. Clearly, the election was rigged, and people want to change governments due to rising unemployment and inflation. But Iranian workers, women, and students have over the years risked everything in order to protest that theocratic, capitalist, misogynist, homophobic and thoroughly repressive regime. They have done so ever since the clerics seized power, truncating and destroying the liberatory basis of the 1979 revolution. I am aware of the U.S. government’s interest in destabilizing Iran’s government, and that some of the labor organizations supporting June 26 are funded by the government and that they regularly betray their own members. These facts do not negate the need to support the masses in their opposition to the existing regime. I am aghast to see part of the Left responding with knee-jerk vulgar anti-imperialism, saying we may not criticize President Mahmoud Ahmadinejad and the clerics because the U.S. has a long history of imperialism there. To speak only of a supposedly “lesser evil,” or just to say “we don’t support either side,” is to ignore the crucial question of what we are for. I believe the Left needs to recognize that there are two worlds in every country, the rulers and the ruled, and to solidarize with the masses of workers, women and students in Iran. The IASWI welcomes the June 26th Global Solidarity Action Day and urges workers and labour activists to take part in this day of action. We fully support and promote the demands of workers in Iran including the *2009 May Day resolution of Workers in Iran, which is stated below. In collaboration with other Iranian labour, left and progressive activists and organizations, and through support of labour organizations and activists in other countries, the IASWI activists have been planning and organizing demonstrations and other actions in support of workers’ struggles in Iran in recent weeks. There have been protests in Canada, England, Switzerland, France and other countries. We’ll issue a more detailed report on all this soon. As labour activists and a solidarity organization, we will participate, and organize relevant actions, on June 26th day of action anywhere we can. It is important to emphasize that as a labour organization in abroad we do not think the Islamic regime of Iran has any desire in accepting workers’ legitimate demands. This regime has unquestionably proved to be one of the major barriers on the way of workers to establish their own free and independent workers’ organizations in Iran and its so called “presidential election” as always is not going to make any difference, if not worse, as far as the interests of the working people, poor, women, students and other oppressed people are concerned. Iranian workers so urgently need their own organizations in order to be able to fight more effectively against the capitalists’ agenda and neo-liberal policies of privatization, mass lay offs, shut downs, de-regulation and so on. The Iranian regime knows this reality very well and thus it is very determined to suppress the growing labour movement. There is a very clear class struggle in Iran, and the working class in Iran is faced today with extremely serious and major challenges and obstacles. We are urging workers and rank and file labour activists in different countries to engage in worker to worker solidarity initiatives with the Iranian workers. The labour movement in Iran is genuinely and refreshingly progressive, anti-capitalist and internationalist. It deserves full support of all progressive forces and workers’ and socialists’ organizations around the world. The day of action on June 26, 2009 is highly needed in the same way as other solidarity actions thus far by workers in Iran and other countries, but unless we built a strong and ever-lasting worker to worker solidarity movement with the working class in Iran in different countries and in partnership with workers, and labour and progressive activists and organizations, Iranian workers will continue to suffer and face the greatest difficulties in fighting back against the existing repressive capitalist system and in leading their struggles to decisive victories. 1- Guaranteed job security for all workers and abolition of temporary-contracts, blank-signed contracts and all new application forms for employment contracts. 2- In our opinion the minimum wages legislated by the Supreme Labour Council is nothing but imposition of gradual death on working class families. We adamantly demand an immediate increase in minimum wages, based on workers’ own estimates expressed through workers’ real representatives and their independent workers’ organizations. 3- The right to form independent workers’ organizations, strike, protest, assembly, and freedom of speech are all part of our inalienable rights. They should be recognized unconditionally as such. 4- Workers unpaid wages shall be immediately paid. Any non-payment of wages shall constitute a criminal act and litigated. Workers shall be compensated for any damages due to non-payment of wages. 5- The expulsion or lay-off of workers under any pretext must be stopped, and all who have been unemployed or have reached the minimum age of employment and are prepared to work, shall receive unemployment insurance benefits, – compatible with decent living standards, until the time of employment. 6- We demand full equality of women and men in all spheres of social and economic life. All discriminatory laws shall be abolished. 7- All retirees should enjoy a comfortable life free of economic worries. We strongly condemn any bias or prejudice in paying the retirees pensions and benefits. 8- We strongly support all demands of teachers, as intellectual workers, nurses and other toiling sectors of society. We consider them as are our allies, and call for the fulfillment of their demands. We demand annulment of Mr.Farzad Kamangar’s death sentence. 9- Since seasonal and construction workers are denied any and all social benefits, we fully support all their demands to obtain such benefits. 10- The capitalist system is the source of child labour. All children regardless of their parent’s social and economic standing: their gender, national, ethnic or religious background shall enjoy all educational, welfare and medical benefits. 11- We demand release of all incarcerated workers, including Mansour Osanloo and Ebrahim Madadi, and an end to persecution of labour activists and withdrawal of all sentences against them. 12- We fully support all freedom and equality seeking movements, such as students’ and women’s movements. Their arrests, trials and incarcerations are strongly condemned. 13- We are part of the global working class, and as such condemn any expulsion and exploitation of Afghan or other migrant workers in Iran . 14- We appreciate the international support towards workers’ struggles in Iran and express our adamant support for all protests and struggles of workers throughout the world; we consider ourselves their allies. We more than ever before emphasize on international solidarity of working class as the path to liberation from the hardships of the capitalist system. 15- May 1st shall be recognized as an official holiday and instituted in the official national calendar as such. All limitations and restrictions for the commemoration of The May Day shall be abolished. Click here to view a complete archive of articles published in With Sober Senses. Individual archives of the different sections of WSS are also available. Click here to view the section archives. Anyone may apply to join by writing to MHI –describe your interest in participating. Now also available as a pamphlet for $5. Order here. Mueller’s Investigation DID Establish Collusion! MHI is happy to distribute this documentary film by Alex Fletcher. It explores many major concepts of the philosopher, activist, and feminist Raya Dunayevskaya, who developed Marxist-Humanism over much of the last century, up until her death in 1987. The 79-minute film contains rare video clips of her speeches and offers glimpses of material in her archives, as well as featuring interviews of 3 MHI members who belonged to Dunayevskaya’s organization during her lifetime. Film now available here. Review and trailer here. 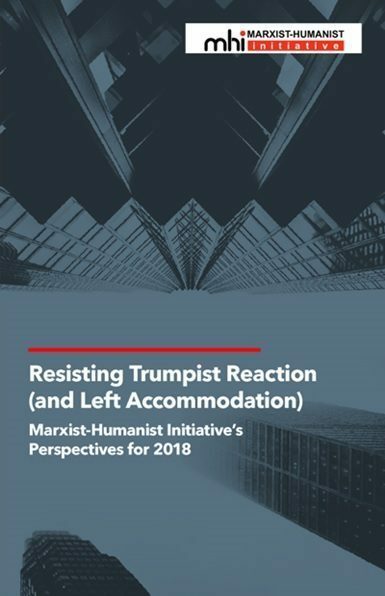 Contributions by Andrew Kliman, David Harvey, and Doug Lain. Appendix by Raya Dunayevskaya. The recent debate between Harvey and Kliman (and Marx!) is collected here in one place. 54-page pamphlet. Price $5 + postage. The illustration in the masthead of this publication, With Sober Senses, is an 1843 political cartoon entitled “Prometheus Bound.” It comments on the Prussian government’s suppression of the Rheinische Zeitung, a newspaper Karl Marx edited in 1842 and 1843. 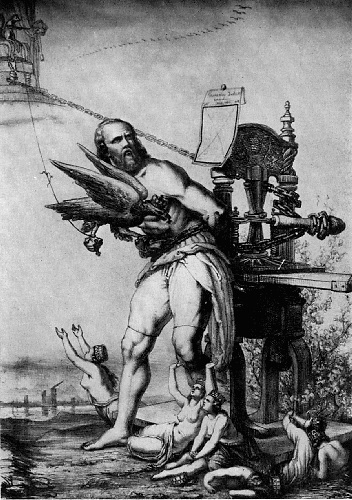 Marx is chained to the printing press; the bird gnawing at him is the Royal Prussian eagle. You may link freely to the material on this website, but you may not republish material unless you request and obtain our prior permission. In that case, you must credit this website in your republication. Only those articles signed or issued by MHI represent the positions of MHI; all other articles represent the positions of their authors. We welcome comments on all our articles. To see our policy on comments, click here. Help MHI to project, develop, and concretize the ideas of Marx and Marxist-Humanism. Please see our Statement of Principles and Section D of our By-Laws for information about becoming an MHI Supporter. We also need and appreciate donations from everyone. MHI can now be contacted directly in several locations in the US, UK and Sweden. See our email addresses on the Contact page. This website’s Archives page contains numerous writings by Raya Dunayevskaya from 1941-1987 and some additional Marxist-Humanist writings. More documents will be added, including some not available elsewhere. The major archive of Dunayevskaya’s works, The Raya Dunayevskaya Collection––more than 17,000 pages in addition to her books, audios, and videos––is housed in Wayne State University’s Archives of Labor and Urban Affairs, Walter P. Reuther Library in Detroit, MI. The Guide to the Collection is available here, and microfilm of the papers is on sale from Wayne State. The Collection is now digitized here. Paper copies of the Guide and Supplemental Guide to the Collection are available from MHI upon special request. Dunayevskaya’s books are not digitized; they are available for purchase through our Literature page, along with some of her pamphlets and other Marxist-Humanist writings.